I can’t say that January is my favourite time of year as I have to muster up the courage to step foot outside and brace the bitter cold back east in Toronto. Growing up on the west coast I did not develop the immunity to survive -30C degrees weather. Thank goodness it’s a short walk across the street to the convention centre from the hotel even though the piercing blizzard winds make it feel kilometres away. I immediately take refuge inside and am quick to get to work so my blood can start circulating and I can feel my toes again. Upon arrival to the booth on the first day of set up I am armed with a Venti cup of dark strong coffee and am faced with a blank concrete space of 2100sqft that’s surrounded by 45 pallets and 5 large wooden crates. Then with a quick wave of my wand… ta-da! the booth magically appears! I wish! The following few days involve a lot of sweat, sometimes blood but never tears. However this time around there were maybe a few tears of happiness because the Canadian Gift Association recognized my designs and finally decided to grant us the highly coveted Best Booth 800sqft and Over Award. Every show we hold our breathes when the announcement comes on over head, waiting in suspense to hear the winners names. For the first time in Danica’s 50 years of business we finally heard ours!!! 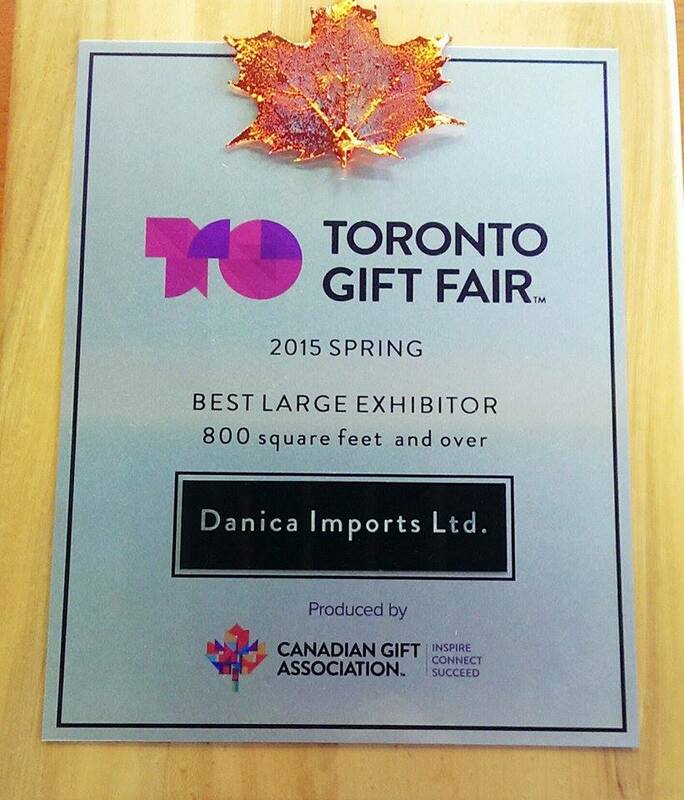 It is such an honour to be awarded this for my displays at Canada’s largest temporary trade gift show that has 24,000 buyers in attendance bi-annually.